Growing up, I would play A LOT of N64 games. It was basically an after school ritual for me — I’d come home, eat a snack and then immediately become glued to the television and my console. One of my favorite games is Super Smash Brothers. I would play hours on end and when I returned to school the next day, I’d jump into these deep discussions about why I thought Kirby was a really awesome character to play. I mean, c’mon, he basically can steal anyone’s special! Plus, that ↓ special? HE TURNS INTO A ROCK TO CRUSH HIS ENEMIES! Because I enjoyed playing Kirby so much in Smash, I eventually rented a copy of Kirby 64 from Blockbuster. Yeaaaah, that was quite a while ago. Admittedly, I still don’t know what Kirby is. I just know that he’s a happy little dude who LOVES to eat. So, I’m sure he would appreciate having his imaged turned into a tasty popsicle! Prep time for this takes about 10 minutes. Chill time for this is about 6 – 8 hours. Decorating time is about 15 minutes. This makes 4 servings. 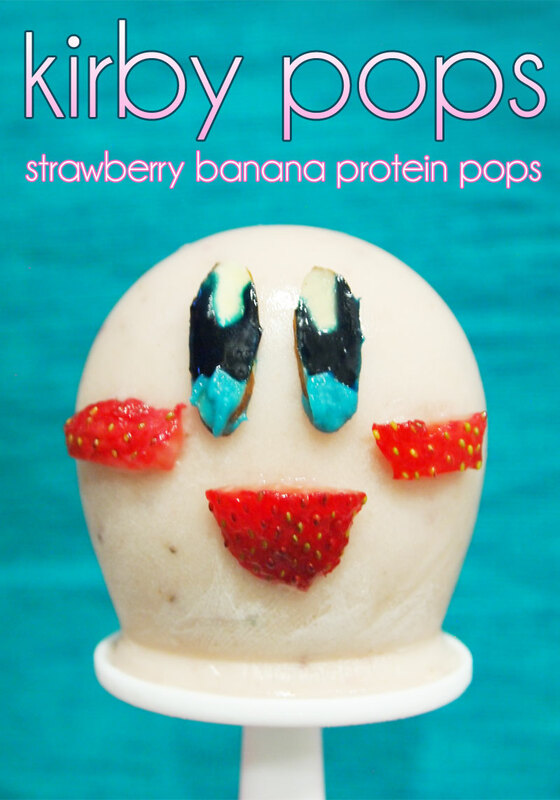 You will need a round ice popsicle maker for this recipe. Combine your protein powders with almond milk in a blender. It should have a fairly thick consistency (think pudding!). Reserve two of your strawberries, and slice the rest. The remaining two will be used to make the mouth and the blush. 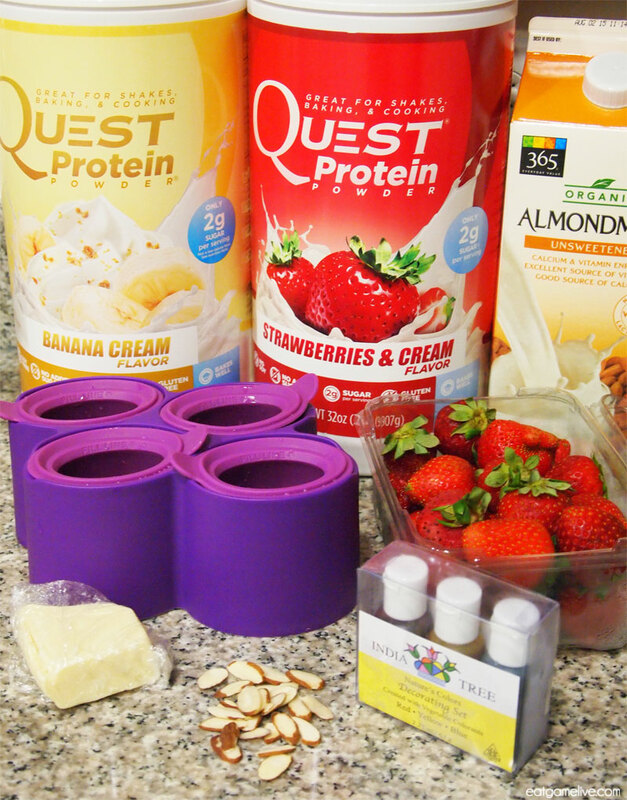 Add your sliced strawberries to your protein mix. Blend the strawberries into the mix. 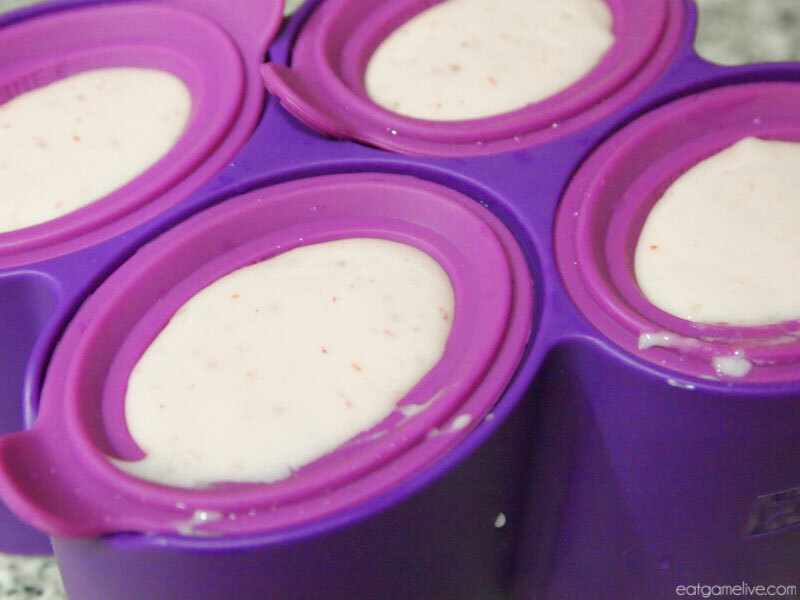 Carefully pour the mixture into each popsicle mold. Freeze for 6 – 8 hours. Heat your white chocolate until it melts. Carefully add 2 drops of blue food coloring. Stir the food coloring into the chocolate. Dip the end of an almond slice into the white chocolate. This will create the blue part of Kirby’s eyes. Repeat this step for 7 more almond slices. Let the chocolate on the almond dry. Add more blue food coloring to the white chocolate. You’ll want the chocolate to be as dark as possible. Using a toothpick or a chopstick, gently drizzle the dark chocolate above the blue part of the almond. Be sure to leave a white space at the top. Allow the chocolate to dry for about 5 minutes. 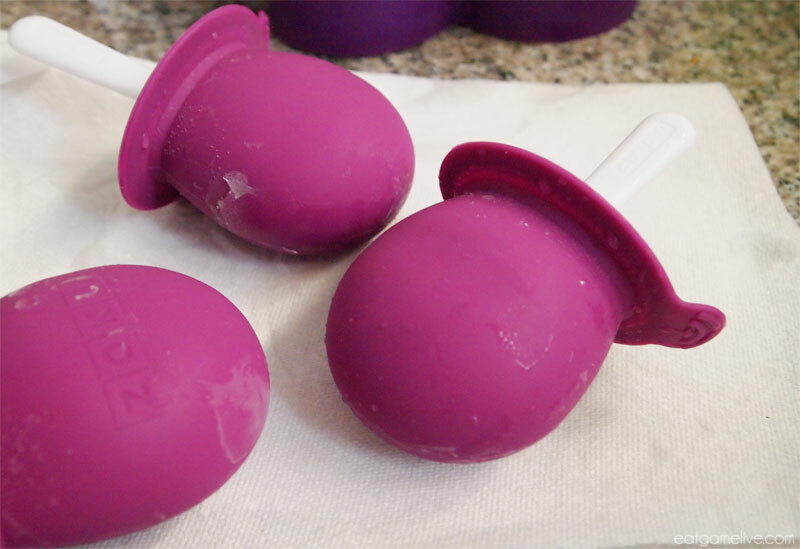 Remove your popsicles from the freezer and take them out from their molds. 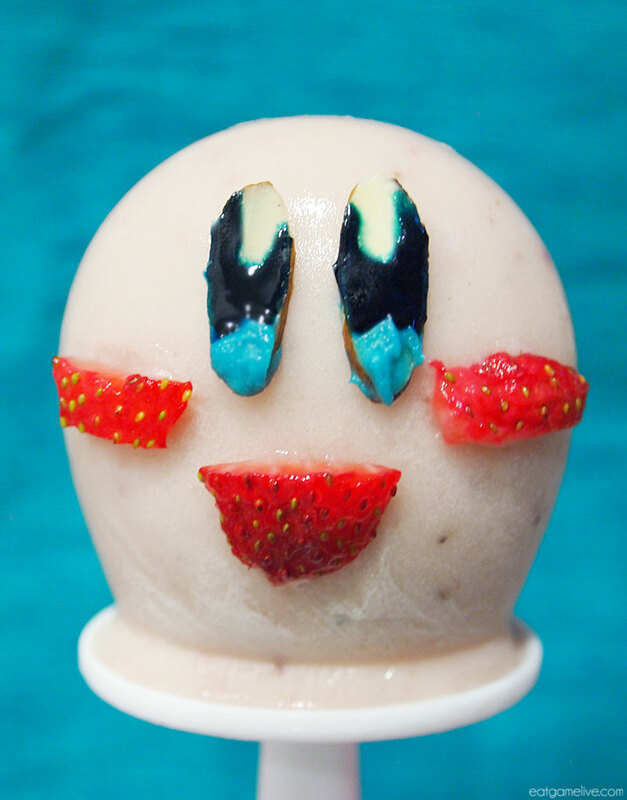 Slice your strawberries and cut out shapes to create Kirby’s mouth (basically cut out a “D”) and blush. Dampen the back of the almonds and strawberries with water. 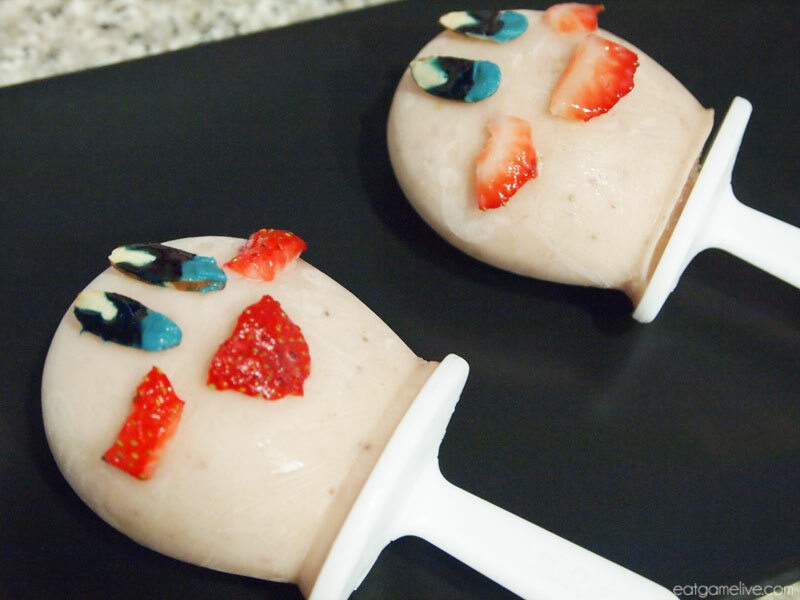 Then, lay your popsicle horizontally (I used a mug to hold up mine) and adhere the almonds and strawberries to the pops. Place the popsicle back in the freezer for 2 minutes. Remove from the freezer and eat! Ta-da! It’s KIRBY! GG WP. Now you’ve got this portable Kirby to nibble on during the warm summer days! 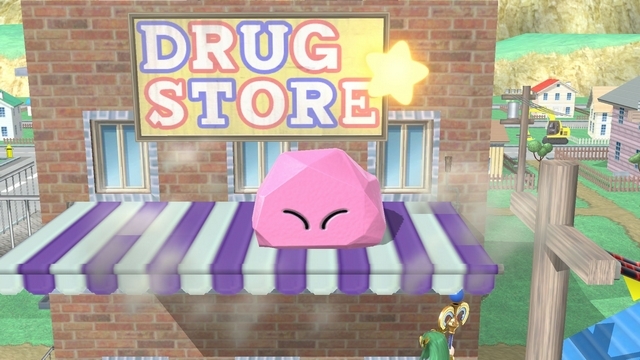 This entry was posted in kirby and tagged kirby, kirby 64, nintendo, popsicles, quest, quest gaming, quest nutrition, super smash brothers by admin. Bookmark the permalink.